Leaked Nintendo 3DS Prototype... Possible Widescreen? Will Anyone Buy a 3D Nintendo DS? 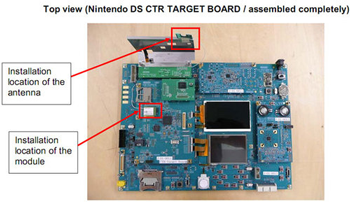 Today, Gizmodo posted an image from an FCC filing submitted by Nintendo that appears to be an early prototype circuit board of the upcoming Nintendo 3DS handheld. While the design of the board will certainly change during development, there are a few interesting tidbits to be noted in the image. The most conspicuous is the top screen, which looks to sport a widescreen aspect ratio. 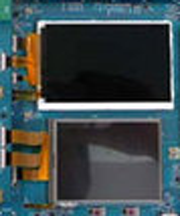 The prototype’s bottom touch screen still appears to be the standard 4:3 ratio that current DS hardware has, though I imagine this will change prior to production and both screens will be widescreen. Whether backwards compatibility with existing DS titles will implement image-stretching or pillar-boxing to fill the new displays is unclear. Another thing to note is that round, white component on the bottom-center of the logic board. While I can’t say for certain based on the low-res picture, it sure looks like an analogue stick, doesn’t it? I can’t really imagine what else it could be, so here’s hoping the 3DS will finally feature a proper thumb stick. The Nintendo 3DS is said to feature autostereoscopic 3D displays which can produce 3D imagery without the use of 3D glasses. It will be backwards compatible with existing DS software, will have built-in force-feedback and improved wireless communication as well as battery life. Nintendo 3DS is rumored to be released this October.